There is no “birth” or “death” for God, since by definition He is primeval, always existing, the source of everything, who has no material form with a particular date of creation. In fact even the individual soul—ourselves—are spoken of as unborn (aja), since spiritually, eternally, we are all part of God. According to the Bhagavad-gita—Krishna’s song or sermon—God is understood to “appear” at various times to serve His purposes. These purposes are generally understood to be reestablishing religious principles, to uplift and inspire the faithful, and to vanquish the miscreants who are causing major world problems. He is compared to the sun, which appears to be “born” at sunrise, and “die” at sunset, but actually always exists beyond our view. The principal exponents of the “science” of Krishna are His Divine Grace A.C. Bhaktivedanta Swami Prabhupada and his followers. His title indicates that to understand God, who is infinite, we have to have the grace of God. That grace comes in a powerful way from a person who is dear to God, or from a pure “devotee” (bhakta) of God. By the grace of the Supreme Lord one finds a teacher of Truth, and by the grace of that teacher or guru, one obtains the shelter of God, or Krishna. In the Gita, Arjuna (the main inquirer) is selected to be the recipient of Krishna’s confidential instruction, because he is devoted to God, and not envious of his greatness. The Vedas (meaning knowledge), although appearing to be from the East, or of “Indian” origin, are actually for everyone who is open to hear them. They are also called “revealed” knowledge, descending into the pure hearts of God’s faithful, or pure devotees. Though the Vedas are certainly quite intellectual, they are not a product of the intellect or senses. While meant to convince our intellect of the truths and greatness of God, these literatures also point out the limitations of reason for understanding the Supreme Spirit or that which is inconceivable to our experience. Thus the Vedas are revealed to the pure devotees, and today we can hear about Krishna from those who are dear to him, and love him. What we hear, we will gradually realize by becoming purified through spiritual practice, and ultimately through obtaining the grace of Krishna, and his pure devotees. By getting to know Krishna, we will gradually love him, and when we fully love him, we will know him in our heart of hearts, as our dear most friend and well wisher. Spiritual love is the way to the heart of Divinity, and Krishna is the heart of Divinity. Prabhupada refers to Krishna, as “the Supreme Personality of Godhead”. This epithet is an elaboration from a primary verse in the important scripture, Shrimad Bhagavatam, or the Bhagavat Purana. After describing many principle incarnations of God, it is indicated that such incarnations are unlimited, like the waves of the ocean. Though unlimited, the incarnations have a source of emanation, and that source is Krishna. Krishna then is seen as the original, supreme personality of the unlimited personalities of Godhead. He is the original candle that lights all the others. When we speak of understanding Krishna, we have to mention the appearance of Chaitanya “Mahaprabhu” (greatest master), who is Krishna’s most recent incarnation, appearing 500 years ago in West Bengal. Lord Chaitanya is a confidential incarnation, a dual incarnation of both Krishna, and his greatest devotee, Shri Radha. Lord Krishna and Lord Chaitanya are both considered the source of all incarnations, though Lord Chaitanya is called the most merciful manifestation of Krishna. That is because he is giving a method to easily know and love Krishna (easy compared to other Vedic methods like yoga, sacrifice, or knowledge, etc.) through chanting Krishna’s names, hearing and speaking about his glorious adventures, and engaging in his service. Shri Chaitanya appeared as a devotee of Krishna or practioner of Bhakti, who demonstrated how to live a life of devotion by his example and followers. The main disciples of Shri Chaitanya have described that God is like a multi-faceted jewel, which can be seen from many angles of vision. There is one spiritual system sustaining the universe and all of life, and the various religions present different views of the same subject matter. By studying the world’s religions, we see that God is generally viewed in relationship to the human beings of the world, with such names as the “creator”, “maintainer”, or “destroyer”, etc. Krishna and his many other names, like Govinda, Gopal, Yashoda-nandana etc., refer to God on his own intimate terms, with his principles lovers in his rural village home called, “Vrindavana”. Krishna refers to the most confidential aspect of God when he wants to be himself and relax with his most closest friends and lovers. In Krishna’s home or abode, everyone and everything loves Krishna more than themselves or each other. He is their very life and soul. Krishna is like a judge who is formally addressed on the bench as “your honor”, though seen at home as father to his children, and lover to the wife. Thus, Krishna is God at home without his crown or without the worship of awe and reverence. Krishna is God in love! He is human-like, approachable, accessible, and very kind, merciful and loving—in a sense appearing ordinary even, with no majesty or effulgence. Though with no overt aspects of the all-powerful God, Krishna is “all attractive” or irresistible to his most dear. One can’t take their eyes from him. Seeing him is always ever-fresh, each moment a new festival for the senses! Of course his so-called “ordinary” appearance is in one sense deceiving, since he expands himself into Vishnu, or the Lord of the Universe, to take care of the manifestation and maintenance of the material world. Yet his intimate devotees or lovers do not care to see him as God, but as one of them, a cowherd person from their simple village of Vrindavana. Seeing God with awe and reverence prevents intimacy of loving exchanges, so Krishna being the connoisseur of love, prefers to live without it, and he has a special world where it is absent. The other Vedic Deities all have a purpose within the world, but Krishna’s only purpose even when he comes to the material world, is to enjoy loving relationships. He is seen playing the flute, dancing with the cowherd boys and girls, wandering in the beauty of the forest, and tending cows. He has other expansions even to speak Bhagavad-gita or to live as a prince as he did in Dvaraka. This feature of God, as Krishna, is charming to his faithful devotees, but sometimes bewildering to scholars or those from other religions. When the British ruled India, they studied the Vedas, with the idea of finding fault and debunking what they saw as heathenism. Thinking Krishna at best a great man of the world, they were shocked at his being a thief in youth, or a person who sported with others wives, or eventually married 16, 108 of his own. A huge theology exists to explain how everything Krishna does is for the good of all, and beyond worldly concepts of good and bad. Not knowing this science, the British considered the activities of Krishna a dangerous myth, which clouded peoples’ intelligence, so they were determined to give the “natives” the real truth of Christianity. Beginners in religion, think their path is the only way, and find enemies to rally against to unite their followers. The beginning motivation to serve God is fear, then personal gain, duty, and finally out of love. Love is the answer. This brings us back to our original point of how to understand Krishna. Krishna reserves the right to not be manifest to everyone. He reciprocates with our level of interest in him, and our purity of purpose in our spiritual search. In addition no one can really take to Bhakti without the blessings of a devotee. 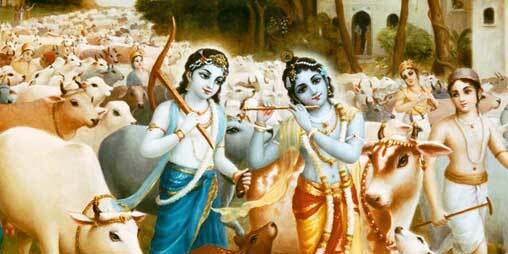 Krishna says in the Adi Purana that, "My dear Partha, one who claims to be My devotee is not so. Only a person who claims to be the devotee of My devotee is actually My devotee." So we can begin to understand who Krishna is by hearing from his devotees. Krishna consciousness or Bhakti-yoga is the science of understanding Krishna, and developing our dormant love for him. Everyone is ultimately a lover of God, but that love is transformed in the material realm into lust for the flesh which often passes as love. The most selfless love of the world gives us a glimpse of what real love is—for example the mother’s unconditional love for her infant. Although there are an infinite number of forms of God, and different religions and spiritual paths that reveal them, the Bhakti scriptures and Krishna.com are promoting the Krishna conception of God as the most attractive and intimate aspect of Divinity. Although this is arguably our subjective opinion, we believe it is a reasonable perspective which is substantiated in the Vedas. Some may disagree, but spirituality is a kind bias through love and affection. So by affection we feel that “objectively” Krishna is the most intimate and attractive form of God. Every path has its’ own reasoning, and those who follow it are convinced of it. However, love of Krishna has its’ own reasoning! What is the best spiritual path, religion, or type of relationship with God? It is the one which is best for you, the one in which you best develop your love God, and for everyone and everything. For the Bhakti-yogis, God is a title, Krishna his most intimate name. From our study, realization and affection we are promoting Krishna. The “proof” of any path in is one’s experience. For you, if it is proof in the reality of Krishna that you desire, then that remains to be uncovered or revealed through your thoughtful study of Vedic literature, associating with advanced devotees, and your sincere desire for union with God. God will reciprocate with you according to your desire to know and love him. Although Janmastami is the anniversary of Krishna’s appearance in the world, it can also represent a path unfolding in your life, or his appearance in your heart.